ROCCAT ROCCAT Tusko - Monitor carrying case - 20"-24"
ROCCAT Tusko - Monitor carrying case - 20"-24"Arrive at your next LAN party safe and secure. The ROCCAT Tusko Across-The-Board Flatscreen Bag isn't just large enough to accommodate your flatscreen monitor with extra holder for a keyboard; it's also got enough space for your keyboard, mouse and accessories. While also offering high level of protection. The integrated rigid plastic plate provides effective protection against shocks - and water and dirt don't stand a chance either. The water repellent material, featuring high quality stitching, is secured together using clip hooks and the intelligent Clip'n'Go system. Arrive at your next LAN party safe and secure. 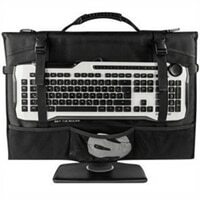 The ROCCAT Tusko Across-The-Board Flatscreen Bag isn't just large enough to accommodate your flatscreen monitor with extra holder for a keyboard; it's also got enough space for your keyboard, mouse and accessories.